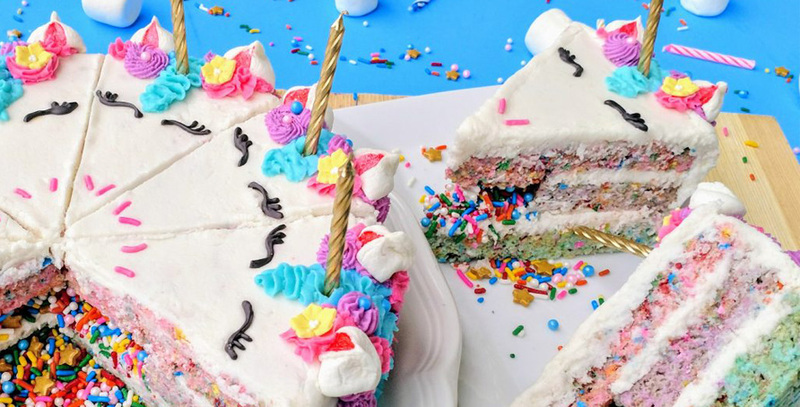 We hope you enjoy this Crispy Unicorn Confetti Party Cake. 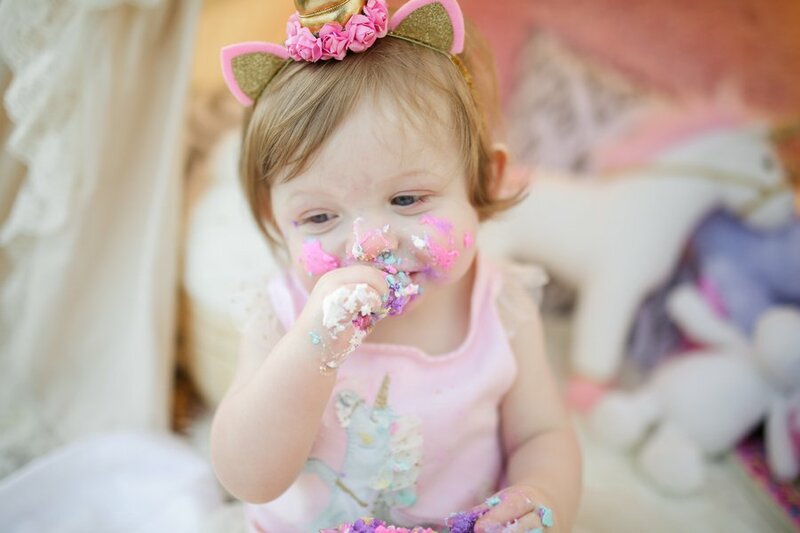 It is perfect for any Unicorn Confetti Party and combined with the right themeing and decorations makes for a magical event. Grease a large microwave safe bowl generously with 2 tablespoons butter. Remove 2 marshmallows from each bag & set aside. Place 1/3 of the remaining marshmallows in the bowl & microwave on high for 30 seconds, then stir. Repeat 1-2 more times or until marshmallows are melted & smooth. Stir in 4-5 drops blue food coloring or enough to reach desired shade. Stir in 1/4 cup cake mix, then stir in 4 cups of cereal. Once combined, gently mix in 1/3 cup jimmies. Press mixture into a lightly greased 9 inch springform pan. Allow to set for 30 minutes, then remove & set aside. Repeat the same process twice more with remaining 2 colors. Once all layers are set, use a 3 1/2 inch round cutter to cut out the center of the purple layer. Enjoy center as a cook’s treat! Set blue layer on a cake plate & spread top with frosting. Place purple layer over blue layer, & frost the top. Pick out 16 pink jimmies from the remaining sprinkles & set aside. Stir assorted sprinkles into the hundreds and thousands & pour into the well of the purple layer. Top with the pink layer. Frost top & sides. Score frosting on top with 8 equal slices. Divide remaining frosting equally into 3 bowls & tint each with blue, purple, & pink coloring. Fit 3 piping bags with assorted tips (I used 1 star, 1 flower, & 1 leaf.) Pipe manes over each slice. Pipe on the eyes with black icing. Adhere coloured hundreds and thousands as nostrils. Using a kitchen shears, cut remaining marshmallows in half width wise. Cut each piece in half again. Pinch together uncut sides to form little ears. Brush insides with a bit of pink coloring & adhere to cake. Garnish with additional sprinkles, cake decorations, & candles.